This is a guest post by Danielle Taylor Porter. Whether we have preschoolers or teens, this idea of having specific, consistent, uninterrupted time with each child is critical, and Danielle has outlined some simple ways to make it happen. It was a good summer. We swam miles in the lazy river at our local water park, burned holes in our grass from the constant use of the slip and slide, and drank gallons of homemade slushies. But with the new school year looming, I found myself mourning the long hours my first grader would spend away from home. Even my preschooler was counting down the days for her own fall activities to start. I couldn’t help but laugh, but it encouraged me to think even more carefully about our time together. I knew I wanted to set aside time in order to have meaningful interaction with my children, but what? We are big on routines and family plans, so I knew we would have lots of quality time through chores, homework, working together, and regular family time. But all our summer play left me wanting something distinct and separate from the regular events of daily living—something fun! Soon, with a little help (here and here), the idea of “Special Time” was born: a simple 15 minutes a day, one daughter at a time. During a family night, my husband and I helped my girls write down some of the things they wanted to do with me one-on-one. The only stipulations were that they had to be things we could do at home that lasted 15–20 minutes. The girls were soon finished with their lists and excited. I was expecting the usual: play dolls, do puzzles, color, jump rope, ride bikes, and read books, but I was surprised by paint an elephant, take pictures, play Russian dolls, eat candy, tell stories, read scrapbooks, and watch a favorite online video spoof, such as Kid History. I wanted this special time to be as solid as my other commitments and appointments so I fixed two separate times on my calendar. (For you Mind Organization for Moms people, I also put these two lists in my Current Projects folder and in my Routines and Responsibilities.) My four-year-old would have her special time immediately after her baby sister went down for her nap. My six-year-old would have hers after school, once she finished her snack and reading for the day. I picked times that fit in the flow of our day and that would be hard to compromise. The very next day we made it happen. With a list to refer to, precious minutes set aside, and other children sleeping or happily playing in another room, special time is in session. My four-year-old wanted to have me help her practice on her two wheeled bike. My first grader surprised me by wanting to sit on the couch and chat while eating the sucker she’d saved from school. What fun! I can say without hesitation these are the best minutes I schedule in my day. Though dolls, pretend animals, and children’s board games will never be something I really love doing, I do love that I am doing something with my girls that is important and fun for them. I love getting to slow down, talk about things that are important to them, and laugh about things I might otherwise give a half-hearted smile to in my haste to put out the next fire. My initial thoughts were concerning the good it would be for my girls, but I have been pleased by how rewarding it has been for me. Special Time is becoming a priority instead of a luxury, for meand my girls. I smiled big when my social-butterfly six-year-old told her anxious-to-play friend, “I can’t play right after school because I have my Special Time. Maybe afterwards, I will come and knock on your door.” Turns out I didn’t need to mark it on the calendar for me to remember after all—these girls won’t let me forget. QUESTION: What do you do in your families to have one-on-one play time? 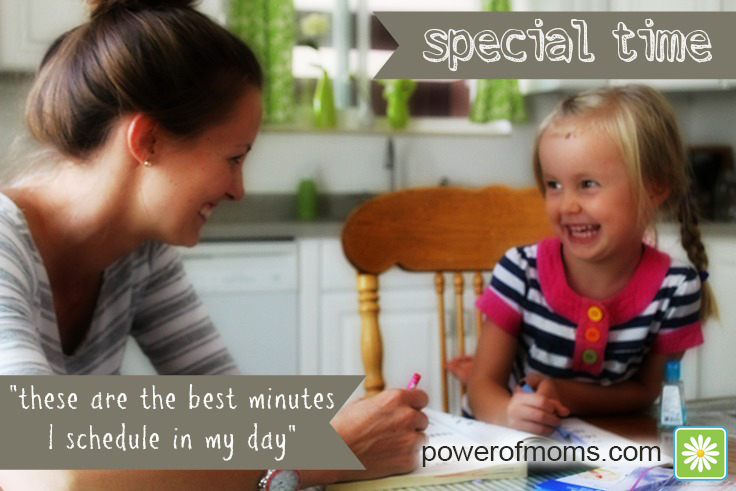 CHALLENGE: Make a kind of Special Time plan of your own, adjusting for the ages and needs of your kids. Try it out for a few weeks and see how one-on-one time can be a lot of fun! Images provided by Danielle Taylor Porter. Graphics added by Julie Finlayson.